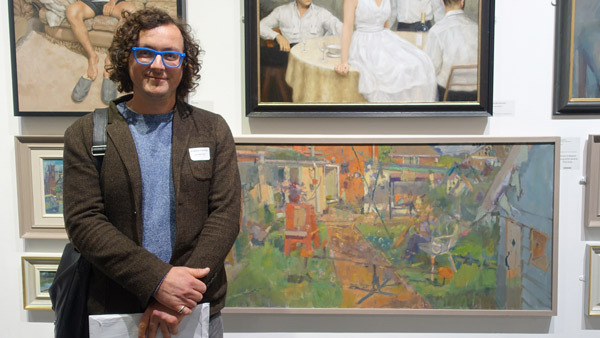 The 126th Annual Exhibition of the Royal Institute of Oil Painters marks the visible start for a lot of people to the presidency of Tim Benson. The consensus so far is that it's looking very different - and very powerful - with lots of excellent paintings. The Private View of the ROI 2018 - the Main Galleries were packed! 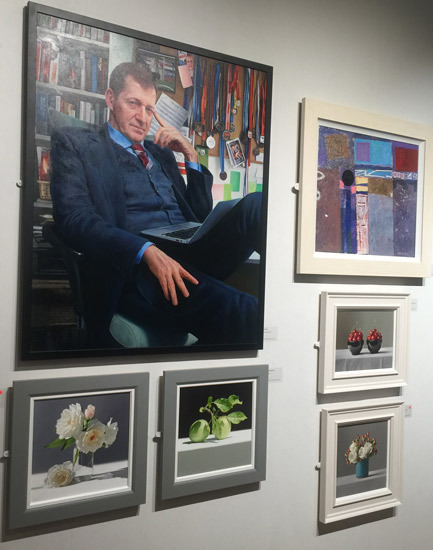 It was difficult to see them all properly at the Private View on Tuesday because the Mall Galleries were absolutely packed with people - and indeed was still very full when I left at 5.30pm. A packed PV is the sign of a well supported art society - and effective communication with known supporters. I'm going to go back and visit it again before it finishes on the 9th December so I can take more time and stand back and see the pics without passing people! 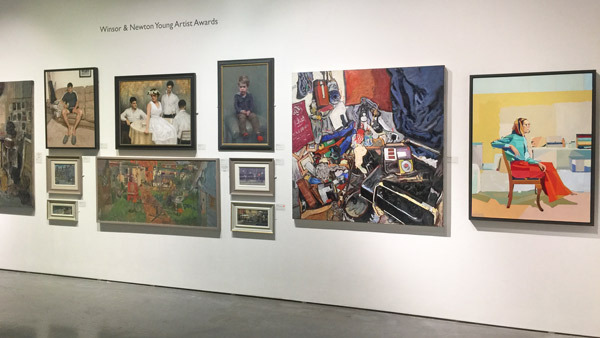 In this post I'm featuring some of the points made by Tim Benson said at the Opening of the Exhibition and the Awards Ceremony. His own website has a strapline of "building awareness through painting" and he seems very focused on carrying this theme over into the activities of the ROI. 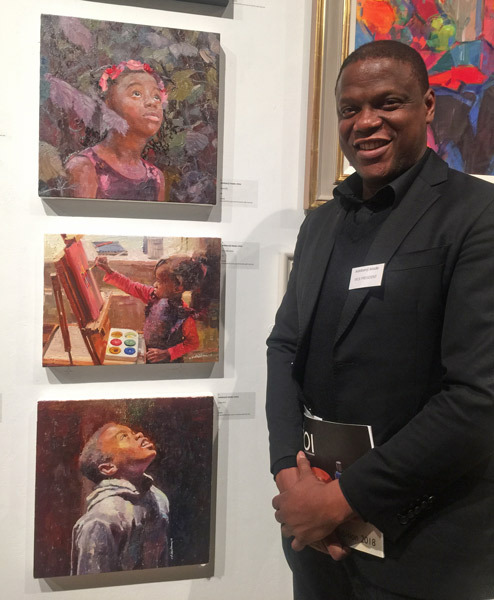 Vice President Adebanji Alade - with his portraits of his children - who also paint! how could the ROI be a ‘progressive’ organisation? Now more than ever there is a schism between the world of painting and the ‘contemporary’ art world. Surely this disadvantages the art world at large? Surely in a time of increasing fracture and division the Art world should be unified? The ROI is in an incredible position to bridge that very gap, a place where painting of all genres is encouraged with neither a bias towards subject matter nor a ‘house style’. We are free to champion works that transcend traditional notions of painting just as we are free to celebrate them. this year we have developed a partnership with the organisation ‘Hope in Tottenham’ to send ROI members into schools in and around the Tottenham area of London to talk to children about oil painting and to show them that they can be the next generation of oil painters and ROI members. Collaborations such as this are vital to avoid our isolation and to ensure that oil painting not only remains relevant but becomes indispensable .....well into the 21st century and beyond. 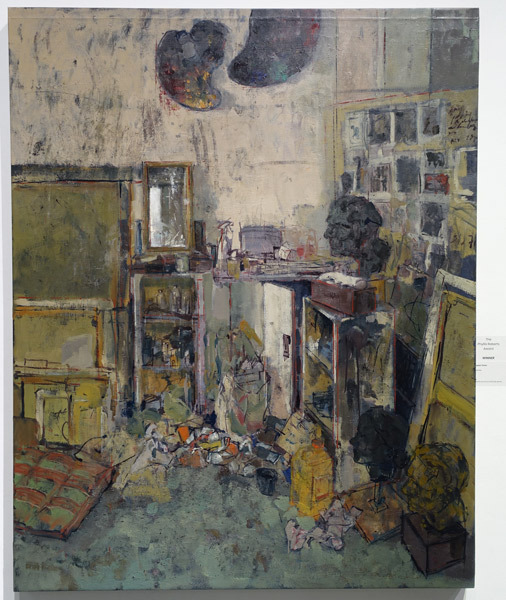 The ROI's Phyllis Roberts Award is intended to support and encourage young painters. 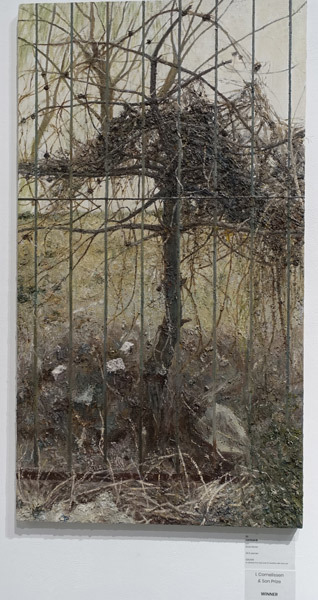 The painting The Last Day by Bernadett Timko, is very impressive and I am entirely unsurprised that it won. I'm getting very used to seeing Bernadette's name in the prizewinners whenever she exhibits in an exhibition. She has an amazing talent and paints, etches and makes sculpture. She was born in Hungary in 1992. 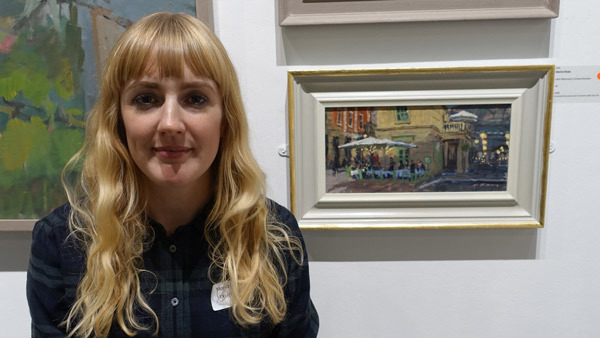 Since 2011 she now lives and works in London and attended the Heatherley School of Art studying portraiture and sculpture between 2014 and 2018. She has also won prizes, awards and scholarships every year since 2014. The art world has long been perceived as the preserve of the social elite and the Art societies are not immune from this tag. My hope is that by building relationships with school, we can demystify the Art world and engage people that would not have otherwise had the opportunity to experience oil paint. 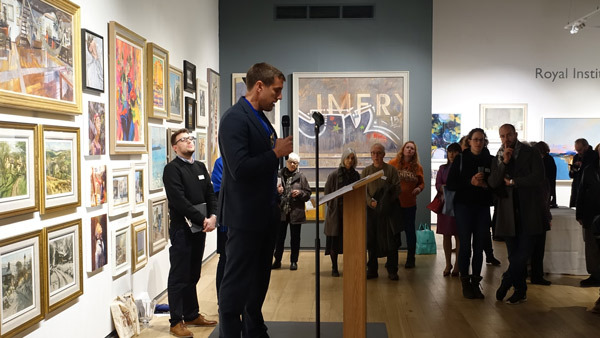 This will build on the ongoing efforts made by the Mall Galleries to make the gallery concept more available and less intimidating for artists. Painting should be accessible to everybody and while the ROI’s membership hails from a range of socio-economic backgrounds we as a an Institute can only benefit from yet more diversity within our ranks, something that will be reflected in the variety of work that we are able to show. This reminds me very much of making a very similar point in relation to another FBA society exhibition earlier in the year. The FBA Societies all need to avoid being seen as what I term - in a rather pointed shorthand - as "middle class, middle aged and middle Englanders". It feels like a change is happening. It is however essential that the societies avoid being like the BBC re. diversity issues - maintaining that they are operating properly until somebody points out that the actual facts suggest otherwise. 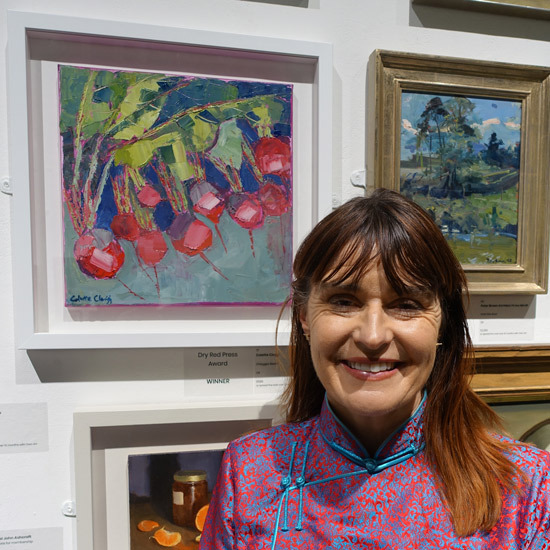 Our Annual Exhibition gives us an opportunity to show the world what we are capable of as oil painters from an ideological viewpoint as well as a technical one, so this year we have a themed show within the main exhibition called ‘Community Spirit’. This small show of Member’s work will offer a bit of ‘cohesion’ in an increasingly divided world, reminding us of the unity within our society rather than it’s divisions. 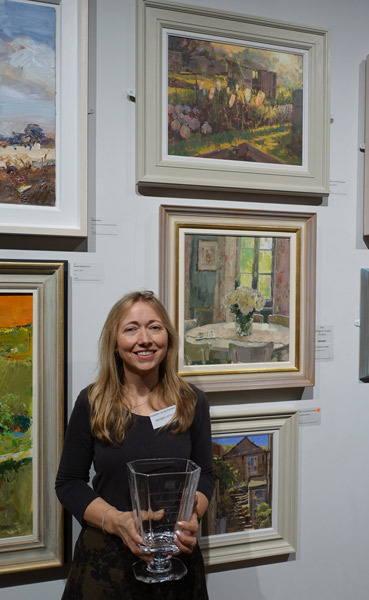 So there you go - from young artist winning a prize to President of the Royal Institute of Oil Painters! ....and maybe a future ROI Council Member or President? 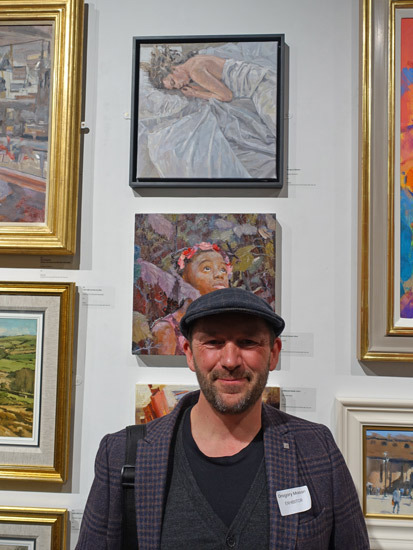 The Mall Galleries posted an album of large images of the paintings which won the ROI Prizes & Awards on their Facebook Page - which is public for all to see - access them here. Haidee- Jo Summers was presented with the crystal chalice - in recognition of outstanding service and contriubution to the ROI. No surprises here for why Fred Coppin is getting won this award and gets a feature in The Artist magazine. 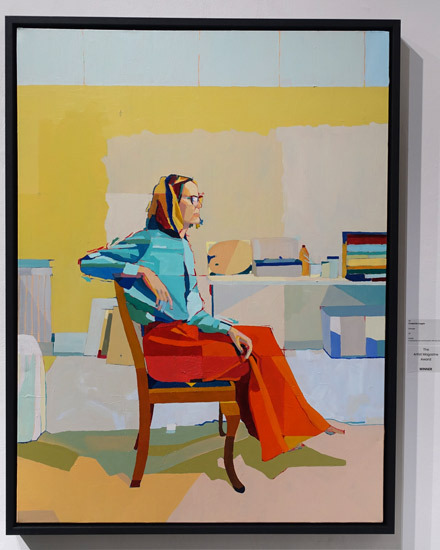 This is stunning painting - even if it did remind me of a rather bright version of Euan Uglow. Third Prize: £400 - Tom Stevenson, Weekend on the Cathedral Close. He lives in Devon, works in oil and paints from life. The problem with providing a review is that I couldn't see all the paintings properly! Still lots of people at 5pm! As one of the members put it, the Private View is a social occasion to meet up with old friends and to talk about painting - and it was PACKED and busy! I must confess I had a fabulous time on Tuesday afternoon meeting people I know and artists I've not met before. himself get put through to the Final of Landscape Artist of the Year! It was all very enjoyable - but I don't feel like I've seen the exhibition! So I'm going to be taking a look again early next week (probably Monday) and will write a proper review next week. That said I'd very much recommend going because what I could see suggests that it's a very string exhibition. I put some photos up in an album on Facebook and they've been getting a very good reception - and hopefully will prompt people to visit. I was very pleased to see that the bulk of the paintings (maybe some 90%?) 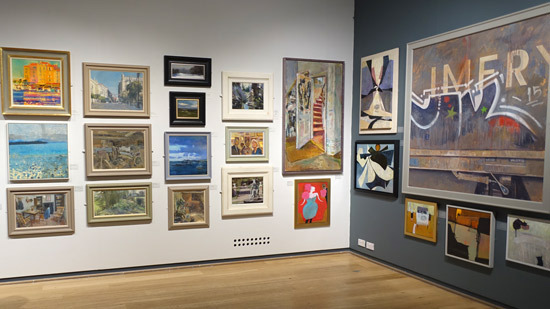 are listed in the catalogue as being in oils and that the ROI is becoming more of an an exhibition which is true to its name - a group of oil painters.